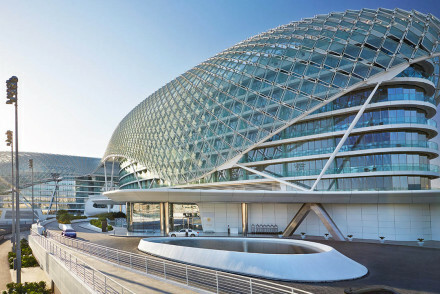 Dubai has the glitz, but Abu Dhabi has the class. Capital of the UAE, Abu Dhabi manages to be both one of the world's most modern cities and one of the most elegant. 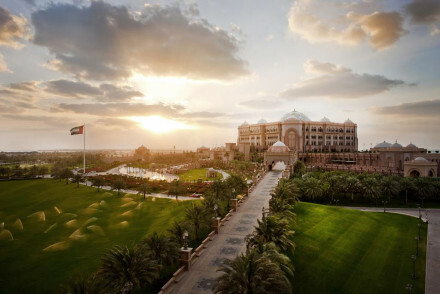 Class over glitz is the same when it comes to the best places to stay in Abu Dhabi, but you'll still find the fantastical palace hotels the UAE is becoming known for. You wouldn't imagine it from the spectacular desert location, but Abu Dhabi is noted for its large parks and gardens - this city has been planned with care, with most of it occupying an island connected to the mainland with two bridges. Fifty years ago Abu Dhabi was a fishing port, so while the rich emirate culture goes back many colourful centuries, it didn't actually happen in the capital. The elegant fort, Qasr al-Husn, was built in the 17th century, and there were a few buildings made of beautiful, white coral, but mostly this was just an ocean of desert. Thankfully Abu Dhabi's planning means that it doesn't suffer from the same kind of epic traffic jams that you can find in Dubai, but it's not immune, this city was built for cars. But that's definitely not an invitation to get behind the wheel! The road rules here probably aren't what they are at home, so you're best bet is taking taxis or the local bus services. Abu Dhabi is a bit to big to navigate totally on foot, so you'll need to take the plunge on the roads or risk missing out. Abu Dhabi city is only going to become more interesting, in 2015 an outpost of the Louvre Museum is scheduled to open, and in 2017 they're getting a Guggenheim. And if you can get out of the city you'll find a lot more than the desert. There you'll discover fossil lined cliffs, waterfalls and mountains. Abu Dhabi has a Falcon Hospital and adjacent museum - falcons have legendary status here and 'patients' are brought in from far and wide. Head off on a tour of their facilities and learn all about these special birds. There is the hugely impressive Sheikh Zayed Grand Mosque with more than eighty domes, four minarets over a hundred metres high, one thousand pillars and prayer space to accommodate forty thousand - wow. And that's just the outside; inside is all gold, marble, semi-precious stones and crystal. Abu Dhabi also boasts 'Ferrari World', which has the world's fastest roller coaster - a must visit for adrenaline junkies! Meander along the Corniche, the spectacular waterfront walkway which stretches along the whole city, passing lovely beaches, malls, marinas, playgrounds and of course places to stop for a break. Take in magnificent views of the city from Observation Deck at 300 - just be sure to remember your camera! Given its recent popularity, be sure to book ahead to avoid disappointment - the best places to stay in Abu Dhabi get quickly filled up. Abu Dhabi's Emirates Palace is one of the grandest hotels in the region - apparently they even have an ATM which dispenses gold bars? But you don't need to check in to visit the art gallery and museum in the lobby, and it's certainly worth popping by. The interiors are tasteful and classy, with plenty of gold embellishments, whilst there are also all the necessary mod. cons. for a splendid stay. Abu Dhabi's scorching and humid in the summer, with the average daily temperature reaching 36°C in August, so you're best off avoiding visiting around this time. The weather's nicest in the winter months (December to March), however this is peak season - so for a quieter but still fairly cool alternative, consider coming in spring or autumn. Visitors can fly into Abu Dhabi International Airport before taking a bus into the centre. British Airways and Etihad fly nonstop from Heathrow, with the journey taking roughly 7hrs15mins. 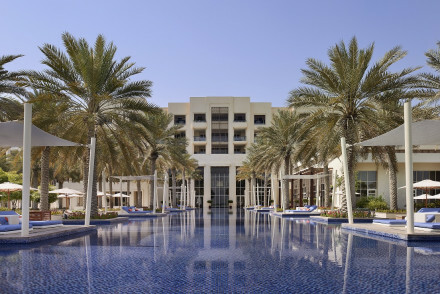 Browse through our list of all the best places to stay in Abu Dhabi. Alternatively, take a look at our recommendations in Dubai. An opulent hotel sat overlooking the Gulf. Naturally it's splendid in style with plenty of gold embellishments, chandeliers and marble. However, there has been some refrain in the design making the feel overall less over-the -top. With every conceivable facility on site this is a crowd pleaser. Families - A kids club, watersports centre and children's playground will undoubtly keep little ones of all ages entertained. Total relaxation - Unwind by the pool, get pampered in the spa and take long strolls along the beach. A top rate five star beach resort with superb facilities for all the family. Luxury rooms and suites all with private balconies, superb dining options, four pools and ocean front location with private beach area. Just minutes from the Louvre Abu Dhabi and a taxi ride from the Corniche. Sights nearby - You're a short taxi ride from the brand new Louvre Abu Dhabi.